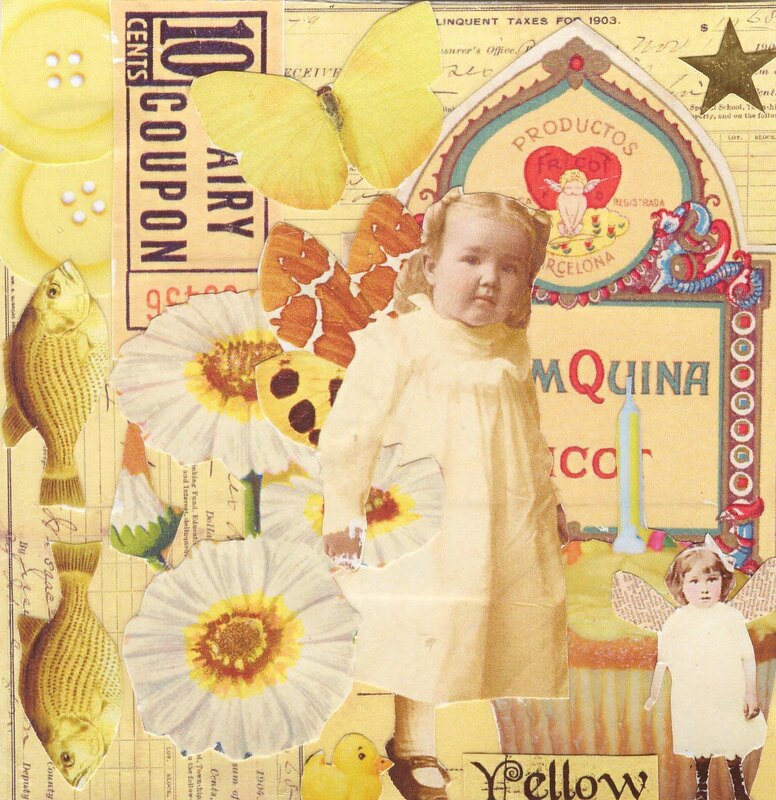 FAT YELLOW art squared 4" X 4". Images by Lisa's altered art. I've done an inchie (above) and a twinchie (below). 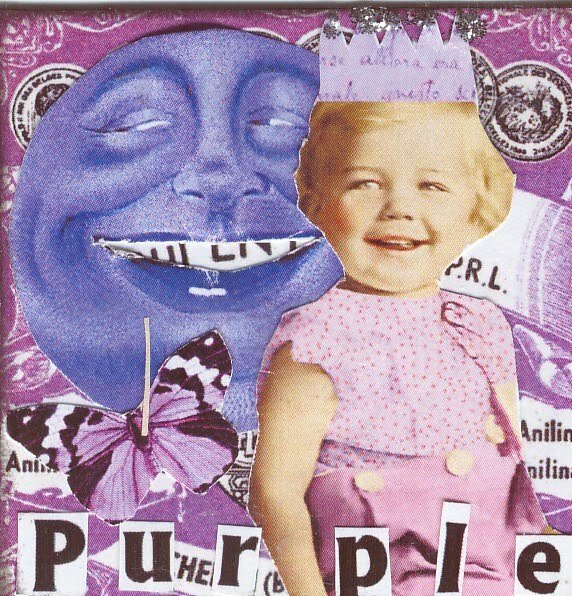 Art jounal page ' GODDESS', words inspired by Suzi blu. I need to have my space to breathe and to feel free, 2b me... listen to me and what I would like or want to be ............not what society wants me to be or imposes on me. The only TRUE REAL friend I need is ME, I need to believe in me, myself, and not what others think or believe about me, I need to do what I want not what others want, to confide in me myself as I know 100% I will not betray myself with secrets, problems or be false to myself. I have to live with myself so being a true friend to myself is better for me, if I'm better to live with then so are those who have to live around me. 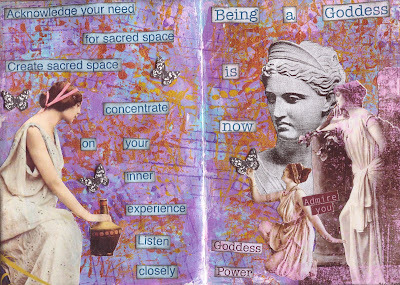 I'm going to try and be a Goddess ...yes me a Goddess, I'm going to start thinking highly of myself and try to nuture myself from within, pamper myself so that I'm fit and raring to go. Will let you know how I get on. 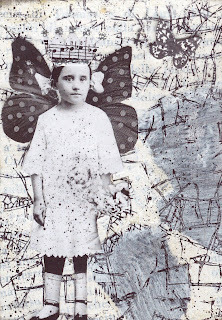 On theme thursday the challenge is things with wings. On the three musesthe challenge is zlightly zetti, althoug I think this would have done grand for both challenges. sorry scanner started to play up whilst scanning this one. I adore the theme with wings, as wings represent 'freedom' for me. 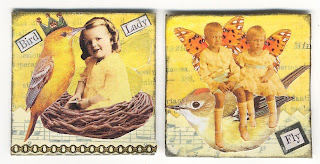 Below are 2 of my favourite ATCs that I made for swaps but I just couldn't part with them and wanted to share with you as the one of the challengs is things with wings. Theme Thursday this week's challenge is script. 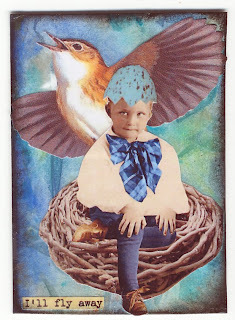 I made 2 ATCs and couldn't decide which one to use , so this week I've been greedy and used both ! 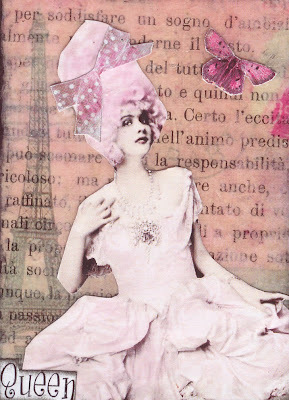 Pink Queen ATC is vintage Italian text, tissue paper, acrylics, gesso and collage images by lisa's altered art ( Queen series ). 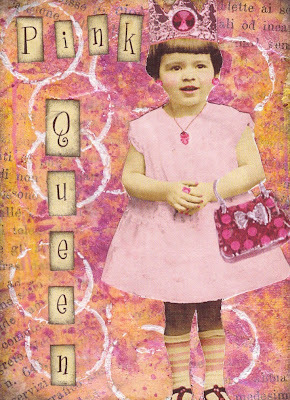 Queen is vintage Italian text background, Gel skin Image transfer and collage images by itkupilli. SATURDAYS WORKOUT challenge this week is BUBBLE WRAP BACKGROUND. 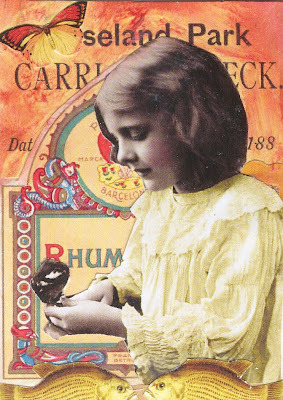 I had already prepared some old vintage book pages with acrylics for journals as done by Traci Bautista and now I've just bubble wrapped them with metallic acrylics. 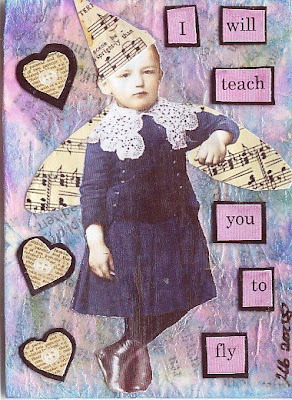 Made an ATC only need to put a saying on and it's done . 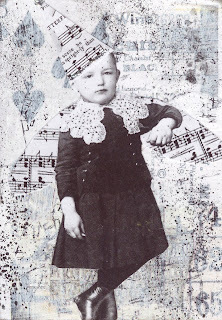 I know I saw a tutorial about preparing book pages with acrylics, I'm sure it was the talented PATTY SZYMKOWICZ check her out she has a fantastic blog. 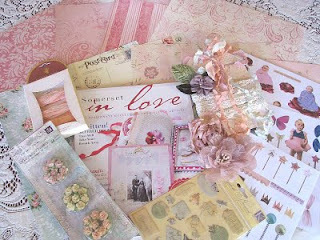 this lady is more than generous with free images on her blog, now she also has a giveaway. You'd be a fool not to check it out. 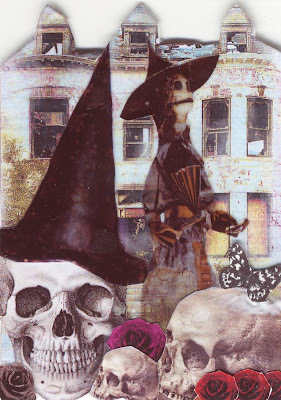 ATCs for All swap HAUNTED HOUSES. 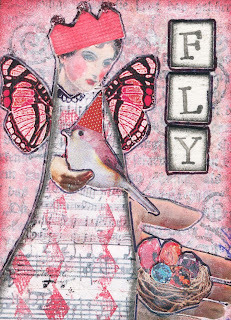 ATCS for a breast cancer awareness swap on ATCS for ALL, images by lisas altered art. 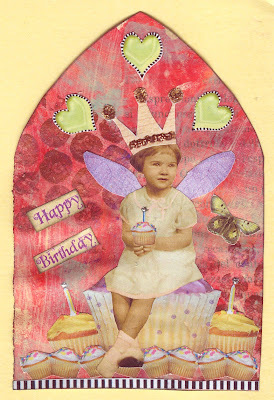 Challenge blog GOTHIC ARCHES is 2 years old, theme this week CUPCAKE, here's my contribution. 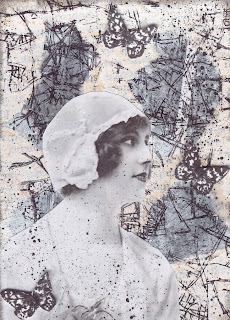 Some ATCs for a vintage black and white swap on atcs for all. 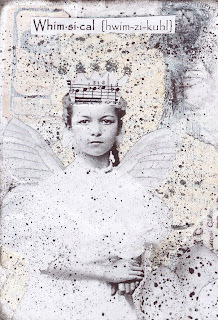 These ATCs are made using mixed media technique, collage, gesso, rubberstamping, watercolours and vintage collage images. crazy amigo challenge this week is to use the measurement of paper as 4" X 2". 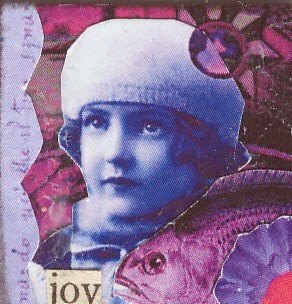 this is the theme on mixed media monday this week............am a little in late in contributing, but thought I would use an old ATC I made. Haven't participated in many challenges lately as my wonderful greythoud Betty isn't too good her bone marrow is not doing its job which should be in producing blood cells or platlets so she is being given a helping hand in the form of steroids. 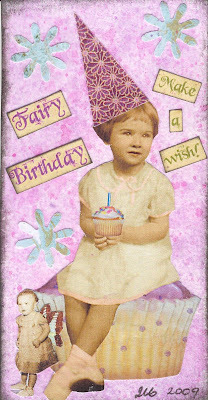 I'm now up to whimsy galz #90. 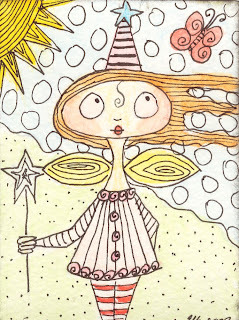 ATCs hand-drawn, watercolours and ink. 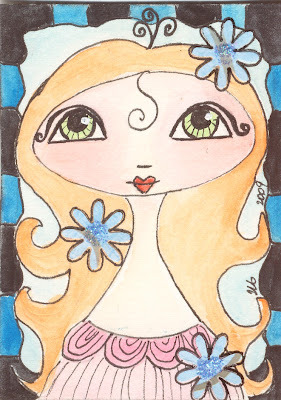 In one month I've made 80 Whimzy galz ATCs with 90% traded. 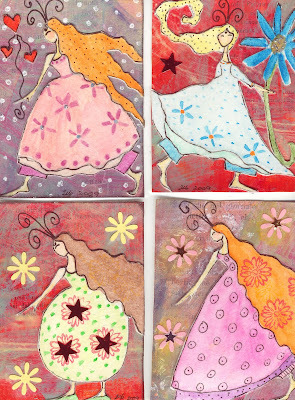 I'm loving making these whimzy galz ATCs. In the last 3 weeks I've traded about 40 of them on the ATC group ATCS for all. 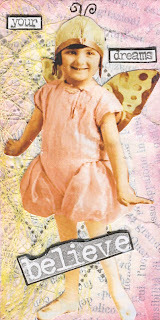 What a fab group and with so many greyt artists, certainly is a challenge to try and better my techniques and learn new things...........something I've been missing for a long while in the world of ATCs here. Greyt taking part in so many ATC swaps too. 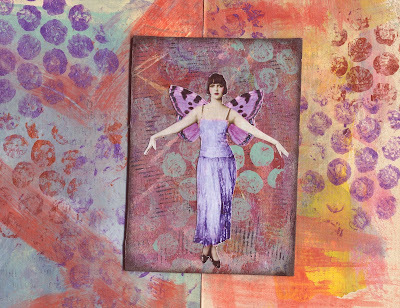 Wednesday stamper challenge is to use the format 2" X 4" and use at least one stamp. Small world of inchies challenge this week is yellow, here are my inchies and twinchies. Challenge on MMM is come fly with me . The background for this I made with watered down acrylics and plastic wrap. SPRING.... a new season has begun and also a new me. I'm going with the flow and am enjoying all the new art I'm learning and making, plus I'm making so many new online friends who are going with the flow too. Since I'm into this self healing and positive way of thinking it's made me realise that part of the fault was mine as I had a low self esteem of myself , very insecure , worried of what others thought about me but now I'm realising that I surrounded myself with negativity ......... certain environments, situations and people. Now that I've finally broken away from this negativity I feel so much better but it's still a little cold out there.....I'm still like a newly formed butterfly learning slowly but surely how to fly. 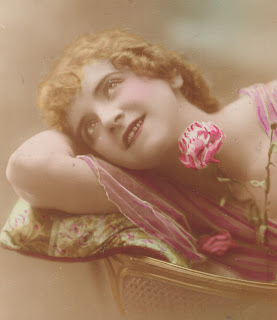 please feel free to use the image I've used it's from my personal collection of vintage postcards...enjoy.....go and make some greyt art but most of all make it for yourself and for your self acceptance. 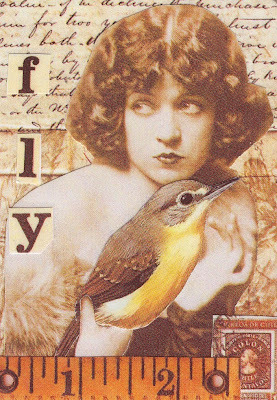 ATC I WILL TEACH YOU TO FLY. I'm learning to fly.....yes, to fly in my direction, where I want and how I want. I'm no longer flying with the flock being pulled in one direction, influenced by them and being gullable. 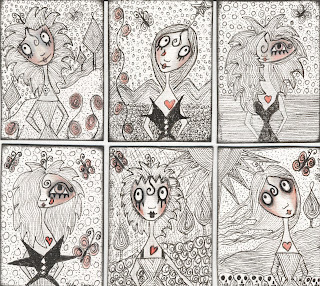 I'm taking some on-line art courses, as I want to broaden my horizons and outlook and some of the artists have also included a self help healing section, and it has really opened my eyes and made me look and question my motives, decisions, judgements etc. I'm seeing myself in a new light and realize how I have been taken advantage of, by myself and also others, and that I need to learn to say NO more often , I have to please myself first and not care about what other people think or say.....Yes to SELF ACCEPTANCE, NO TO NEGATIVITY & YES TO POSITIVITY. JENNIFER CARTER greyt and caring artist and person is holding a draw for one of these two above dolls, you have the possiblity to win one of these and it costs $1.00 per chance and the donation goes towards this kitty catz progject here.